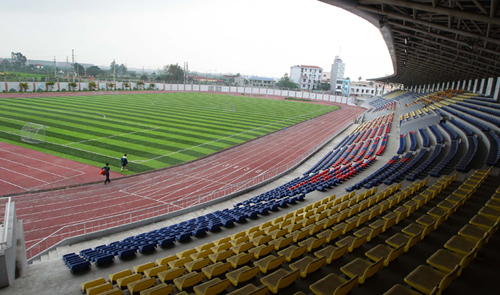 VND80 billion (US$3.8 million) was spent on this sports center in Hoai Duc District, Hanoi but it is often left unused. Many Vietnamese people have hailed Prime Minister Nguyen Tan Dung’s decision to withdraw Hanoi as host of the 2019 Asian Games (Asiad). “This is good decision that satisfies local people. It proves the Prime Minister has listened to the public,” a reader whose name is Le Xuan Thuy commented on Tuoi Tre website. “Vietnam is still poor so the state budget should be used for other immediate tasks. Don’t follow the crowd to make the country poorer,” another reader named Le Van Phet pointed out. “Thank you, Mr Prime Minister, for making the right decision. Giving up the right to organize the Asiad is appropriate for the current situation, because the country's social welfare projects are inadequate and Vietnamese athletes are not skilled enough yet” – reader Do Anh Tu expressed his opinions. Prior to the Prime Minister's decision, a Tuoi Tre survey that received 13,661 votes from its readers showed that 84 percent of the respondents did not support the idea of Vietnam organizing the 2019 Asiad. They suggested that Vietnam return the right and pay a fine instead. At a central meeting on Thursday, Prime Minister Nguyen Tan Dung instructed the Ministry of Culture, Sports, and Tourism to work with the Olympic Council of Asia (OCA) and involved partners on a withdrawal plan, according to an April 17 statement of the government office obtained by Tuoitrenews. The government leader expressed thanks to OCA for their support and assistance to the development and growth of sports activities in Vietnam as well as supporting the country’s bid to host the quadrennial sporting event. He admitted that Vietnam has little experience of organizing a large international sporting event like Asiad and will bid for hosting it at a proper time in the future. The prime minister also cited financial difficulties as a major reason for the withdrawal. “The global financial crisis and economic depression has affected Vietnam's economy severely while the state and local budgets are very limited and must be used for other urgent [socio-economic] tasks” – Dung told the meeting. In 2012, OCA awarded Vietnam the right to organize the 2019 Asiad after the country beat Indonesia in a race. The Ministry of Culture, Sports, and Tourism has said that the country will only need an estimated US$150 million to hold this multi-sport event. But many government ministries have argued that such an amount will not be enough for hosting the competition, adding that the real fee will be multiple times that number so Vietnam should not host it.